Thank you K ai for Pete the Cat! Who doesn’t love Pete the Cat, the cute little blue cat from James Dean’s picture book? K ai students have their very own Pete and he has been traveling with students and teachers throughout the school year. As his journal tells, his K ai friends have taken him on some exciting outings and weekend trips around and even outside of Hong Kong. I was thrilled when I was asked whether I would like to take Pete the Cat home for a sleepover. What a fabulous idea as I got time to read the picture book and enjoy the many wonderful stories and pictures in his traveling journal. I got to share what his stay at our place looked like before returning Pete and his travel folder to K ai the next morning. Thank you K ai students for letting Pete the Cat stay over at my place for a night and for sharing your wonderful stories about him with me! In an effort to further develop their knowledge around material arrangement in the library as well as providing an opportunity to demonstrate how much they have learned already, K students have slipped into the role of librarians recently. Twice when they came to the library, they discovered books scattered on the floor, in need of re-shelving. During the first session, we worked on the re-shelving as a class. During the second session, the class was split up into two groups. Each group re-shelved and then presented their arrangement (and explanations why they had arranged the books in certain way) to each other. It was great seeing students explore the books and the books' call numbers before making decisions. They also demonstrated a good understanding of the two main categories of books (fiction and nonfiction) and that they are located in different areas in a library. Further, students showed awareness of the fact that nonfiction books are grouped by topic, while fiction books are organized by authors. "Let's put the fiction here and the nonfiction there." "Let's put all the animal books together." "Hairy McLary books are here." "Emily Gravett goes with Emily Gravett." Kindergarten students are currently inquiring into a unit under the transdisciplinay theme Where We Are in Place and Time, looking in particular at toys and games. One of the key concepts driving the unit is reflection. I thought this would provide a good opportunity for us to reflect on some of the things we have learned in the library so far this year, while connecting to the learning in the classroom through one of the key concepts. We began by brainstorming a list of authors we got to know through the library and classroom so far this year. In a next step, we wondered about where to find books by these authors in our library and in the process revisited the make up of call numbers. Call numbers consist of two parts, the first indicating the section (here: E for Everybody section), the second giving the first three letters of the author's last name. Students also got a chance practicing to create call numbers - and had much fun with this! We imagined that we had written a picture book and then worked out what the call number would look like and where on our shelves the book would consequently be found. Knowing about the way materials are arranged in the library helps students in locating books by favorite authors independently. It is also a pre-requisite skill for using our online catalog. During our read-alouds, I currently cover the author/illustrator information and let students make guesses about who the author/illustrator might be. We so far enjoyed: I Want My Hat Back, This is Our House, and Dogs. While students were not yet familiar with Jan Klassen, they recognized Bob Graham's illustration style (even though they were not able to name him yet) and did a fantastic job in identifying and naming Emily Gravett. She has definitely made an impression on our students. Below is a cute book trailer for the most popular title of the three books. There were many questions at the end of the story whether the bear had eaten the rabbit or not. We agreed that he hadn't - but that he had just taken his hat back and chased the rabbit away. I Want My Hat Back by Jon Klassen - Book Trailer from Candlewick Press on Vimeo. I just discovered that the beautiful video Ellen Leou shared with us during her visit is now uploaded on YouTube and her website. I know all Kindergarten students will be as excited as I am about this! I hope that looking at the video will make many more of our readers interested in reading about Lulu's adventures around Hong Kong. We have a copy in our library - but the book is also available in bookshops throughout Hong Kong. Enjoy! From the moment she welcomed the children and shared the cutest video about the real Lulu, she had her audience - children and adults alike - mesmerized: Hong Kong-based children's book author and illustrator Ellen PW Leou. There was an immediate connection and we couldn't wait to hear about Lulu's adventures. Instead of reading the story word by word, Ellen told the story alongside the beautiful illustrations which she had projected on our whiteboard. She quickly drew us into the story, letting us become a part by inviting us to sing along as Lulu started off on her adventure. While we loved following Lulu on her adventure around Hong Kong, we were equally excited about asking questions. We had so many questions about Lulu in the story, the real Lulu and the author herself. We had been well prepared, having written down our questions already the week prior to the visit. That made sure we didn't forget a single one - and Ellen Leou answered each and every question. Our questions ranged from whether the real Lulu had a tail or not to whether it is hard being a writer. I appreciated Ellen Leou’s honesty with students when talking about the writing process. She told students that starting to write is really hard and that it takes a lot of effort to do it well, that the editing and rewriting process can be pretty boring. Yet, she encouraged students to persevere. "Writing is hard work, you keep on trying and trying until you get it right. So don't get discouraged if it doesn't work out right away." She said that trying out stories on a friend was a great way of finding out whether they were good or boring. It was also interesting to hear her explain how she starts of and what media she eventually uses for her illustrations. Ellen always begins with the writing process. Once that is completed, she says she has the pictures clearly in her head which makes it easier to work on the illustrations. While she uses different media for her illustrations (e.g. water color, ink, pencils, Chinese brushes), she always starts out with pencil drawings. That's not surprising when looking at the illustrations which have such fine and delicate patterns. Just look a the Chinese vase on one of the first pages, drawn with so much love for detail. Amazing! Ellen kindly stayed on after the visit and shared some more information with me about herself and her writing. One of the things that I always find most interesting when learning about an author is their motivation to write. Ellen Leou said that she loves reading. She loved and read all day long when she was little. That is definitely a perfect reason to become a writer! The reason why her stories are set in Hong Kong, she explained, is that in her opinion there aren't many stories about what Hong Kong really is like. Most stories talk about people from Hong Kong going elsewhere and finding something magical there. She, on the other hand, wanted to open the eyes of the many children growing up in Hong Kong, to the beauty of their city. It's all about perspective, she says, and wants us to focus on what we see around us. She made an amazing comparison, which was a true eye-opener for me: It's the stories that bring the magic to a place, making a city special and romantic. When we come to a city, we bring stories that we have heard from others, like some extra luggage with us. "The stories people tell about a place are part of the magic of that place". I am glad that you brought some of this magic to our library! - authors know their stories so well they can tell them without looking at the words. The number one question, on the other hand was, where and how the book can be bought! And isn't this exactly what we are hoping for our students when we invite authors, that they mesmerize the kids with their stories, that they can think of nothing else but getting the book to read and treasure the story over and over again? What could be more intriguing than hearing about an author, who as a child would have liked to become a witch? Reading a story (Spells) by the same author in which a frog – unsuccessfully – tries to become a handsome prince to kiss a princess! Imagining what the author might look like in real, turned out to be another fun activity. With the help of a KWL chart, we reflected on what we already knew about the author, had learned through the video and were still wondering about, thereby realizing that we still know very little about her. Using a KWL chart is a great way to practice sorting out our thinking, what we know already and what we still want to learn. It also helps us to practice formulating wonderings, while differentiating between statements and questions. Students had wonderful ideas on how we could find out more about Emily Gravett, e.g. by reading other books, searching for information about her on the Internet, by calling her, skyping her or writing her a letter. We thought about how great it would be if she would come to visit our school to then discover through a dedication in one of the books that she had actually been to HKA already in the past! I am sure our inquiries will discover many more exciting facts about this author. There is already now a lot of interest for her books. 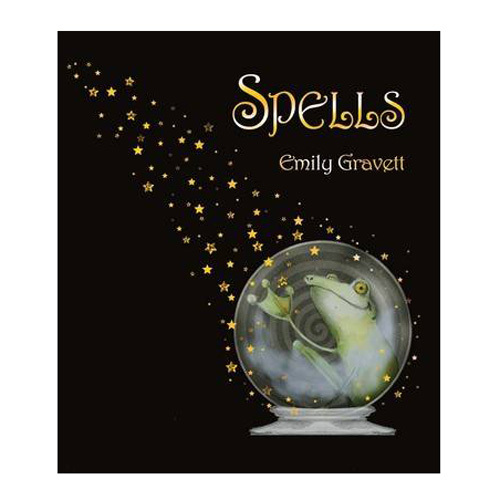 If you would like to learn more about Emily Gravett, have a look at this interview on the Reading Rockets website. K students are currently inquiring about Australian-born children's literature author and illustrator Bob Graham. He writes about fairies, people, trucks and pets. Some of his books look happy, some sad. Some books have lots of colors, others have few. ... the author writes books. ... he uses lots of colors. ... the books are made. ... how he can be so good at drawing. ... he made the pictures. ... he choses the colors and words. ... he writes about himself or his friends when he was younger. ... he is a grown-up or a child. ... he gets his ideas/his ideas for the pictures from. We next thought about how to best find answers to these questions and students had great ideas on how to go about this: looking in books by Bob Graham and searching for information on the computer and the iPad. So we took the next step by reading another book by Bob Graham (Queenie the Bantam) and comparing it to the other one (How to Heal a Broken Wing). While we noticed similarities (e.g. the people in the illustrations looked similar, the story was about people and a bird), we did not yet discover answers to our questions. Our plan is to look on the Internet and check in other books as we continue our inquiry. While learning about a new author and illustrator, students will also follow an inquiry process, being guided through each of the following phases: Tuning In, Finding Out, Sorting Out, Going Further, Drawing Conclusions, and Reflecting and Acting. We thereby support the development of their inquiry skills as well as encourage them to select from a wider variety of reading materials by introducing a new author. Research/inquiry skills are relevant to any unit of inquiry but have been identified as one of the transdisciplinary skills especially targeted in the Kindergartners’ current unit under the transdisciplinary theme of Sharing the Planet (Central Idea: “Living things coexist and depend upon their environments”). In support of this goal, when visiting the library over the next couple of weeks, students will be introduced to and provided with the opportunity to further practice and apply information literacy skills that facilitate inquiry. Relevant benchmark skills under Standard 1 of the Library Program are: understanding the basic organizational structure of books, distinguishing between fiction and nonfiction resources and using materials provided to find answers to questions posed. We have just begun to look into the difference between fiction/nonfiction materials. Being able to differentiate between these two is a basic information literacy skill – simple but crucial when searching for information. It will make students aware from which materials to obtain information to answer their questions. At the same time, students will become familiar with the different parts of a nonfiction book (e.g. table of content, index, glossary) that facilitate the information finding process. So far students have worked in pairs, looking at and comparing two books on a particular animal, one fiction, the other one nonfiction (e.g. the story of The Tiger Who Came to Tea paired with an information book on tigers). While we are just at the beginning of this inquiry and students are yet to learn more about the differences and specific features of the two different types of books, most students pointed without much hesitation to the nonfiction book when asked which one they would use if they wanted to learn more about the respective animal. In the weeks to come, we will continue with this and similar activities that will allow students to learn to differentiate fiction from nonfiction, to name the different parts of a nonfiction books as well as to get a first experience in making use of this knowledge during inquiry when searching for answers to questions. Browsing Sticks Look a Lot Like Rulers! K students have been keen on gaining more independence during check out, having other options than choosing from the two separate shelves filled with favorites each week. To allow students to do this, two skills have to be addressed and practiced: how to choose a good book and how to use a browsing stick. Both are benchmark skills, included in our Library Program in Standards 2 and 3 respectively, which we will continue to practice from this point onwards until the end of the school year. Both are important skills: for one, we want students to have the habit of thinking about the choices in reading materials they make, guiding them to age and (later on) reading level appropriate materials; secondly, it is important for students to have skills like the use of a browsing stick to honor their responsibilities in the use of shared resources and learning space. Browsing sticks are used as place/shelf markers when students are exploring possible titles to check out. The browsing stick is put into the place of the book on the shelf while the book is being explored. If the student decides not to check the book out, he/she will know the book’s correct place to return it to. We are using rulers as browsing sticks in our library so the comment of one of our K students on returning to the classroom, “these browsing sticks look a lot like rulers”, was very fitting. Students are generally very excited about the use of the browsing sticks, even though it requires much practice and patience to use them correctly, so that the books remain in their correct spot. While we have been talking about making good choices when selecting books since the beginning of the year, we now emphasize that students take the time to open up a book of interest, look through it, reflect on whether it has the right amount of pictures and text and whether it is really a book that interests us, before taking it to check out. In addition to these two skills, students are also learning about the arrangement of books in our Everybody section – this is where we keep our picture books. Books are arranged in alphabetical order by the author’s last name. Students have been locating books by favorite authors such as Leo Lionni and Eric Carle.